- Plate tectonics is a theory that explains movement, seismicity, volcanism, continental drift, and mountain formations. - The theory of plate tectonics has equivalently done great for geology what Charles Darwin's theory of evolution did for biology. 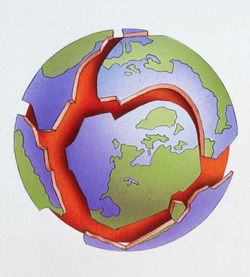 - The theory states that the Earth's lithosphere is broken into 7 large, rigid pieces called plates. - A few other minor plates exist including the Arabian, Nazca, and Philippines plates. - The plates all move in different directions at speeds from 2 cm to 10 cm per year.